This course provides satellite communications engineers, system architects, and technical managers with a thorough review of innovations now applied to systems and technologies for 2012 and beyond. Over the past decade, satellite communications has been transformed from a technology for specialized situations in narrow markets into a broadly-based networking scheme that addresses the full range of fixed and mobile communications needs. Professionals are expected to understand how to apply, implement, and operate the new systems and technologies but cannot rely on outdated information. Key advances in space platforms, broadband analog and digital payloads, and new RF and baseband devices for ground terminals are presented and analyzed. How these innovations apply to different situations for broadband fixed services in video and IP data is addressed, as well as innovations in the mobile field on how satellites may be integrated with 3G and 4G wireless systems. Because of the rapid introduction of new space and ground-based technologies, such as digital beam forming and DVB-S2 adaptive coding and modulation, new applications benefit from higher bandwidths that are cost-efficient and reliable. Consequently, engineers and managers who develop and employ satellite resources need to update their knowledge about these and other emerging technologies. Practical examples from industry and associated evaluation techniques are provided throughout the course. At the end of the course, participants should be able to apply new satellite-based networks and gain awareness of future improvements and enhancement for service delivery to end users around the world. A set of notes containing each presentation page and any reference material is distributed on the first day of the course. The notes are for participants only and are not otherwise available for sale or unauthorized distribution. Bruce R. Elbert, MSEE, MBA, President, Application Technology Strategy, Inc., Georgetown, Texas; and adjunct professor (retired), College of Engineering, University of Wisconsin, Madison. Mr. Elbert is a recognized satellite communications expert and has been involved in the satellite and telecommunications industries for over 40 years. He founded ATSI to assist major private and public sector organizations that develop and operate cutting-edge networks using satellite and other wireless technologies and services. He contributed to the engineering of a satellite network to deliver video programming to commercial aircraft, guided the introduction of Communications-on-the-Move (COTM) terminals for emergency services, evaluated a Big LEO MSS system under realistic conditions, and planned the implementation of a VSAT WAN for an international nonprofit organization. 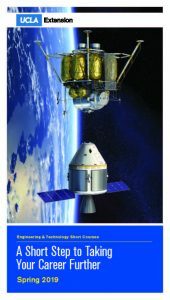 During 25 years with Hughes Space and Communications (now Boeing Satellite Systems), he directed communications engineering of several major satellite projects, including Palapa A, Indonesia’s original satellite system; the Hughes-owned Galaxy satellite system; and the development of the first GEO mobile satellite system capable of serving handheld user terminals. Mr. Elbert has written seven books on satellite communications, including The Satellite Communication Applications Handbook, Second Edition (Artech House, 2004); The Satellite Communication Ground Segment and Earth Station Handbook (Artech House, 2001); and Introduction to Satellite Communication, Third Edition (Artech House, 2008). He also was a recipient of a UCLA Extension Distinguished Instructor Award in 2006.